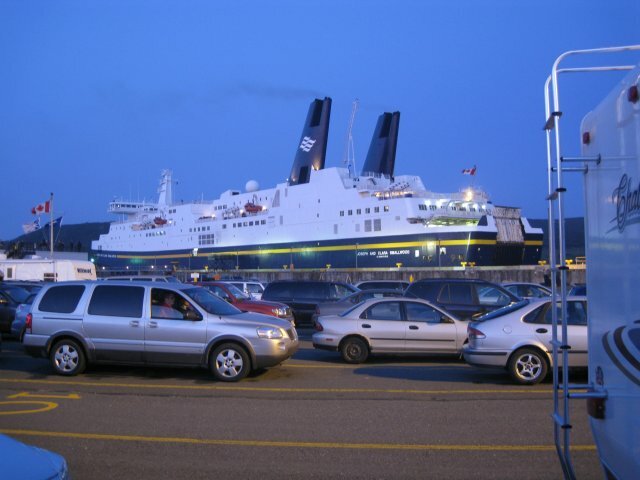 The ferry left Argentia at 11:15 PM. It seems it is behind schedule as only 3 of the 4 engines are working. A part that never breaks in the almost new Caterpillar MaK engine broke. Since there was no spare, they have to wait for the replacement part to come from Germany. Since this part never breaks they probably have to wait for the replacement to be manufactured as well. I have been following our speed and position on the GPS. We set out at 20.4 mph (about 2 mph less than with all 4 engines going) but 2/3 of the way across we slowed down to 17.5 mph so we will be even later arriving. Hopefully we can make it to Truro before darkness. The weather today has been clear and sunny at about 60 degrees. Winds are 10 to 15 mph from the southwest. The waves are 2-3 ft. The photo was taken out the window of the View as the MV Joseph & Clara Smallwood arrived in Argentia. Joey Smallwood was Premier of Newfoundland at the time of Confederation in 1949. He was the politician behind the controversial Resettlement. The ferry got in at 4:15PM. We were underway at 4:30PM Newfee time and we made it to a campground just past Truro by 8:40PM ADT.